This weekend sees the streets of Fleet transformed for the Fleet Carnival. Carnival runs from Friday 30th June – Sunday 2nd July, with the Grand Procession on Saturday 1st July. 2017 is the 62nd anniversary of the Fleet Carnival and the theme this year is ‘Under the Sea’ so expect to see plenty of starfish and seahorses on display. 2016 was a record year with 40 procession entries. 2017 could beat that with 35 entrants already registered, including local schools, charities and companies such as Everyone Active. The people of Fleet have chosen Surrey and Hampshire Borders Riding for the Disabled as the nominated charity this year. Procession entrants will have their buckets ready to collect donations along the route. As always the Carnival offers something for everyone. Friday sees the opening of the Carnival at 5pm on Calthorpe Park playing fields. An evening of fun fair and live music awaits. Those visiting the marquee can take part in the family Bingo night. On Saturday a full programme is on offer with stalls open from 10am – 5pm. The Bar/Pimms tent and food stalls run even later until 9.30pm. Enjoy live music throughout the afternoon from 3pm – 9.30pm. The Kidszone is open from 12-5pm and the Baby show takes place at 11am. If you think your little cutie is a winner then you’ll need to be at the Carnival marquee by 10.45am to complete the entry form and pay the £5 entry fee. There are 4 categories available, from 3-18 months. Sunday sees the dog show and car show take centre stage. More live music and food is on offer, as well as the Maker’s Market and funfair. The Maker’s Market will be situated in the Fleet Carnival Marquee on Calthorpe Park and will have over 40 stalls including Crafters, Quilters, Jewellers, Painters, Jams and Fudge. The music line up is yet to be confirmed but promises to have plenty of local talent on offer. Fleet is a thriving community with a regular calendar of events such as this to bring local people together. If you are looking to move within or even relocate to Fleet and its’ surrounding areas then we can help you find your ideal property. Why not check out our properties currently for sale, as well as some comments from happy customers who have sold their property through Check 4 Houses. We can sell your home from just £599 or 0.5% + VAT. Please give us a call on 01252 819725 or contact us for a free, no obligation valuation of your home. What is a property sales contract? When you agree to sell your property with an estate agent, the sales contract becomes a vital document. It clearly sets out what is and is not expected of you, as well as what you can and cannot expect of your agent. 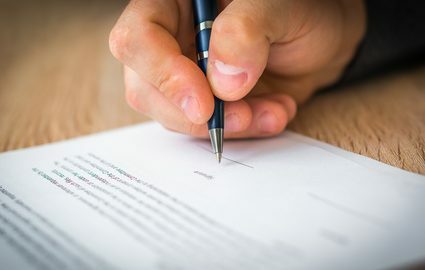 It might seem like lots of small print, but it is important you carefully read and evaluate the sales contract, so you know what you are signing up for. Always make sure the property address details are correct including the postcode. Mistakes can happen – but they can cause confusion with solicitors further down line, should you proceed with a sale. Double check this is the price you discussed and agreed with the agent. However do remember that this isn’t a valuation or any guarantee of the price you will actually achieve. It is simply what you and the agent have agreed to start marketing the property at. Most property sales contracts are for sole agency. This means that you cannot ask another agent to sell your property at the same time. Even just a one-off viewing because they happen to have the ‘perfect candidate’ is not allowed. This area is vital as it sets out your rights, should you not be happy with your agent. Everyone goes into an agreement hoping it will all go perfectly. But things don’t always go to plan. You don’t want to get stuck with an under-performing agent for months so check and question if needed what is written here. Don’t sign for more than 8 weeks and expect to see a notice period of no more than 14 days. Confirm that the fees you will pay are what you have discussed with the agent, including when they have to be paid. Historically all estate agency costs were paid on completion which was when you received the money from your sale. Your solicitor paid the fees directly to the estate agent. But with the rise of online estate agents this has changed. Some have up-front costs. Others have fees that are payable on exchange. This can work well as long as you receive sufficient deposit from your buyers or have the cash available. Also don’t forget the VAT in your own calculations as it can make a real difference. We don’t recommend you pay more than 1% for any estate agent and do consider up front/one off payment options as they can save you thousands. Finally, ensure you read through other items such as whether you will be required to agree to or pay for extras such as For Sale boards. Confirm how offers will be dealt with so you know what to expect during the process. Whether you choose an online or offline estate agent – a major national chain or a local self-employed agent – the principle and importance of the sales contract remains the same. Don’t be afraid to ask questions if you are not sure. Taking the time up front to get things right should ensure a swift and successful sale will follow. At Check 4 Houses we offer a flexible and reliable service that is as stress free as possible. We can sell your property from as little as £599 or 0.5% + VAT, saving you thousands compared to some high street agents. Please give us a call on 01252 819725 or contact us and we would be delighted to give you a free, no obligation valuation of your home.